At-home neurostimulation is here, but there are questions and concerns. Squirt some conductive gel on your skin, place a lightweight headset on your noggin and, according to a number of companies at CES, there's barely a limit to the types of self-improvement you can achieve. You can improve your sleep or your athletic performance, or lose weight. You might relieve nausea or even aid depression. And with almost no effort on your part. Many of these gadgets use tDCS -- transcranial direct current stimulation -- to mildly stimulate or suppress neurons firing in certain areas of the brain. It's a straightforward mechanism that has been heavily studied in connection with everything from math skills to post-stroke rehabilitation. There is much we still don't know about how the brain functions, and tDCS research is not conclusive -- it merely correlates electric shocks with improvements in conditions without our understanding why. Yet when it works, it's a noninvasive, relatively cheap clinical treatment that's fairly safe, beyond potential burns and mild discomfort. Off-the-shelf devices that tap into this research, mostly to help users focus or relax, have been around for a while. Yet, increasingly, startups are allowing you to administer your own electric zaps, to achieve a host of goals. Modius, for instance, is designed for weight loss. It doesn't use tDCS, because its currents don't hit the brain directly. Instead it targets your vestibular nerve, which affects the hypothalamus. As CEO Jason McKeown explained, the hypothalamus controls fat storage, appetite and metabolic rate. By stimulating it, Modius essentially tricks your brain into thinking the body is in motion, which jacks up your metabolism. "It feels like you're moving," he said. "It's a pleasant floaty feeling." To me, it was more of a lightheadedness, like a dizzying rush of blood to the head. McKeown claimed that, of the 650 people using Modius, 80 percent lost weight, with an average decrease of six pounds after six weeks. After an Indiegogo campaign last summer, the device went on sale this month for $499. 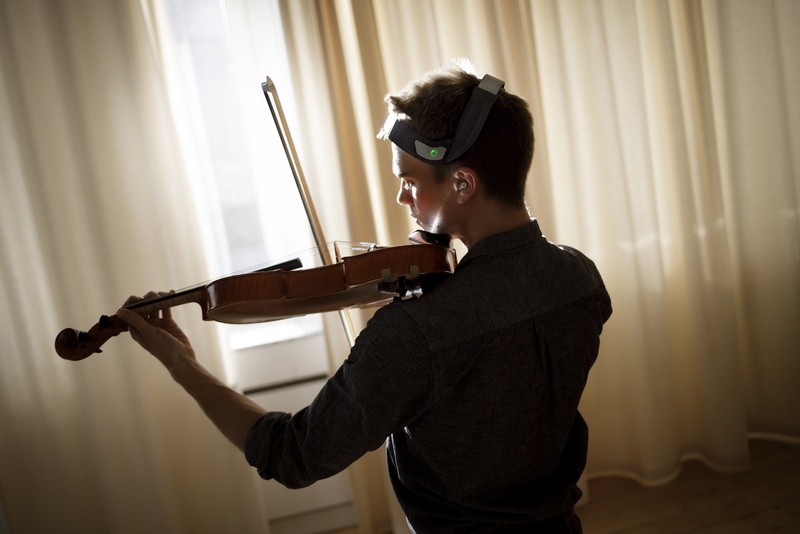 Meanwhile, Danish company Platoscience's headset, called Platowork, is designed to help you be creative or focused, depending on the setting. (Another product still in development is called Platoplay; the company says it will boost eSports players' performance.) The company says that 15 minutes with the headset shortly before you want to work gives you a brain boost for about an hour. Research indeed shows a link between tDCS and creativity, and the company pitches its product as a way to stop procrastination or break through a mental block. "We don't help you be better at creativity or focus; we help you get into that mind-set," said Morten Lindhardt Madsen, the company's UX designer. Then there's Ybrain, a startup from Seoul, South Korea, that claims to treat depression. In South Korea, depression rates are comparatively high for a developed country, but the condition still carries a public stigma. The company says it wants to provide private relief to users. "We found that many patients who have depression are not coming to hospital," said a spokesman. A number of papers have shown that tDCS can decrease depression, and a recent review claims that depression is one of the most responsive conditions to mild electric pulses, along with addiction and fibromyalgia. In an unpublished study by Ybrain, 56 percent of patients with major depressive disorder responded to their device. In these patients, the treatment by headset was comparable to selective serotonin reuptake inhibitors (SSRIs), which are a common form of antidepressant. The study consisted of 12 tDCS treatments in six weeks, involving 96 patients in Korea -- a relatively large sample size compared with similar studies. The clinical model is called MINDD and is approved by Korea's Ministry of Food and Drug Safety (the FDA equivalent) for treating depression and post-stroke rehabilitation. It is being used in more than 30 hospitals, according to the spokesman. The company also showcased a consumer model, which they hope to launch in 2019. Together with more established neurostimulation companies at CES, like NuCalm (which is about to sell its consumer model, ReNu, with a catalog of potential emotional outcomes) and Halo (which primes your brain for workouts), this sector of devices is filling up. Yet, although there's more than a decade of tDCS research, some experts in the area are reluctant to prescribe it for conditions like clinical depression. The issue is that when consumers see treatments on the shelves, they have every right to assume they're safe and effective. In the unsupervised hands of consumers, there's a risk that a one-size-fits-all dosage may not fit the patient. For instance, tDCS treatment on depression patients in a Taiwan psychiatric facility resulted in outbursts of rage in two instances last year -- episodes that could have been missed if they had taken place at home. While Ybrain's consumer model will not allow users to change the dosage, the company acknowledges that patients with epilepsy or undiagnosed bipolar disorder could be harmed by the treatment -- and they cannot say why 44 percent of patients showed no improvement in their study. Modius, meanwhile, can be used only once a day for 60 minutes, after which users will be locked out. Both companies say they will educate customers on holistic treatment for depression and weight loss, respectively. But ultimately, they can't make people listen. We are forever chasing self-improvement, and neurostimulation promises immediate results. Yet without solid science, a doctor's guidance or specific regulations, these consumer products simply might not work. Then again, if the technologies emerging at CES take off, they'll raise a host of new questions too: Will users rely on them to the detriment of their long-term health? Could they become addicted to mini electric shocks to the head? If mishandled, this technology could turn out to be ineffective at best, and dangerous at worst. And of course, the allure of a quick fix might be too strong for its own good.